The need to keep a community informed, connected and calm in a crisis has not been felt more this year than in mid-Atlantic and Northeast states devastated by Hurricane Sandy. 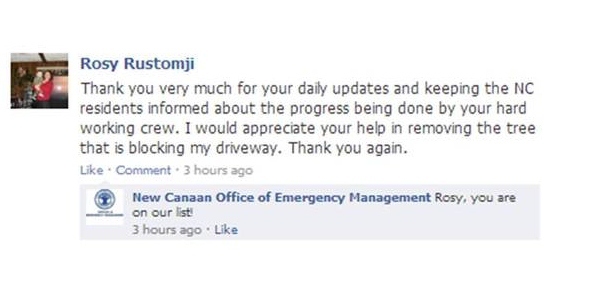 In the town of Connecticut where I live, roughly two years ago, a Facebook brand page was started: New Canaan Office of Emergency Management. It’s mission: “To protect the lives and property of the citizens; and prepare for emergencies, coordinate emergency response and recovery, and collect and disseminates emergency information.” Did they live up to their word? 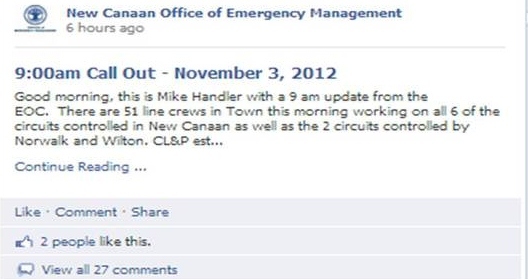 Hurricane Sandy caused 68% in this mid-sized Connecticut town to be without power, 132 downed wires, 140 roads closed, serious electrical fires, one that trapped firefighters, and flooding. Then, there were reports of price gorging on water and gas by local merchants, scams and rogue FEMA agents. Yet, during a time of hardship, anxiety and worry, “Likes” for the OEM went from 2054 to 2826. Why? Their demonstration of care and commitment replaced as atmosphere of chaos and crisis. How did they do it? 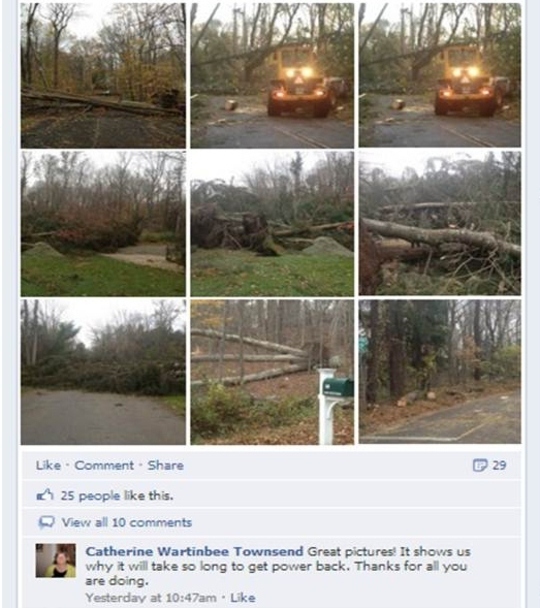 Here are 7 ways Facebook was used by the OEM to weather Hurricane Sandy. 1. PUT TIMELINESS AS A FIRST PRIORITY: Every post to the OEM was answered within a short time even if it wasn’t the desired response. 3. 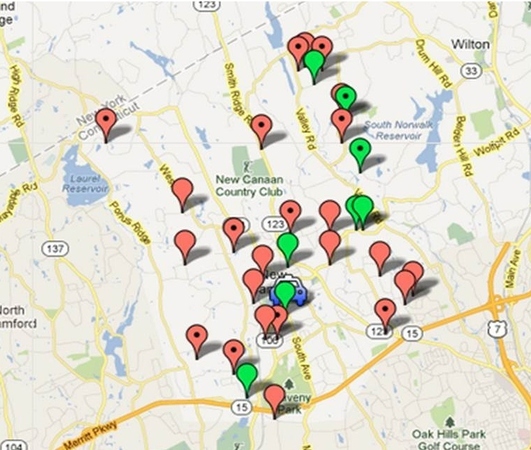 USED APPS TO REPORT ON EVERY NEIGHBORHOOD: Google Maps App was a fixtures that showed what was going on every street. In this map, the red pins are downed wires on roads; the green pins are downed trees. This is the map 5 days after the hurricane. At first, it was much more dense with red and green pins as well as yellow pins for fires. 4. PUT A FACE TO THE POSTS: The name, Mike Handler, stood behind every post. 5. LOOKED OUT FOR ONE ANOTHER: When the underside of humanity showed up, the OEM quickly stepped in. 6. PRODUCED CALM BY DEMONSTRATING CARE AND COMMITMENT. Gratitude started to be the subject of people’s posts. 7. SOCIAL MEDIA PROVED FASTER THAN THE NEWS MEDIA: Every major news outlet in the area turned to the OEM for the latest activity and update. Their “news” was often what the OEM had already reported. Many town in New Jersey and Long Island endured much worse devastation but the hurricane hurt this town. 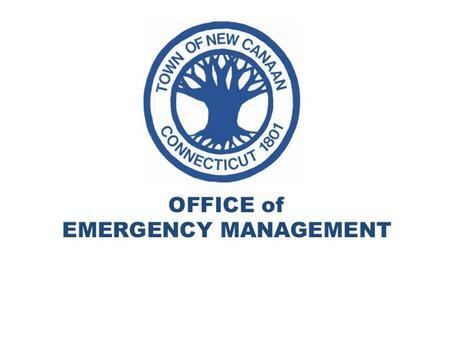 It is equally clear the Office of Emergency Management helped this town and proved a “best practices” in crisis management of how it can be replicated by others. 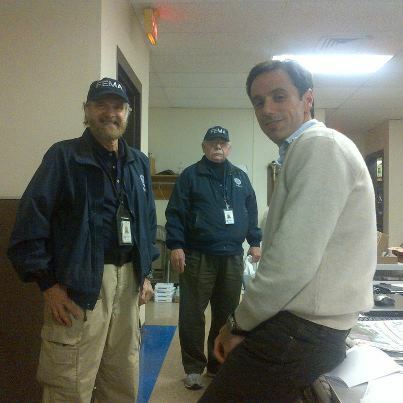 By the way, that’s Mike with the real FEMA agents. 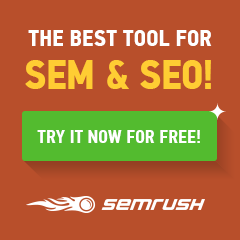 Could you use an OEM on Facebook in your community? This is a great post. I’m working on something similar about a local business in my area who used Facebook brilliantly during the recent challenges (you’ll see it next week). But I think this only underscores both how important social is overall and how business (or towns, in this case) can use social media to connect with their customers. Great, great post. And I’m thrilled to see things getting back to normal. My community COULD use this … we have a Facebook group that connected the moms in town and was great for sharing info … but our town was way too silent. The Google maps app is terrific … didn’t know you could do this. Oh, how I wish we have something like that here. We’re still 50% without power and are getting very little information from our EOC. 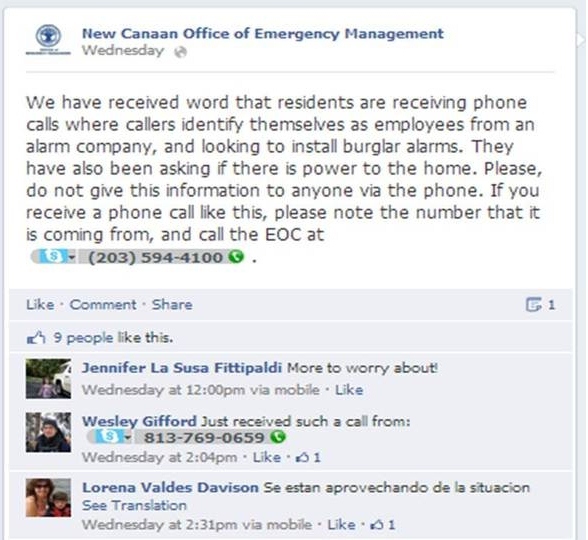 I also heard that New Canaan was updating the residents by phone two or three times a day? Pretty impressive and a good way to keep the panic down. Living in the same town, I totally agree that the Town did an awesome job with text, cell and social media alerts. When out of power for many days, communication helps a lot. The Google Map of ‘hit’ areas was incredibly helpful and was up very quickly and modified as calls came in. Other towns could learn a lot from our town’s activity. 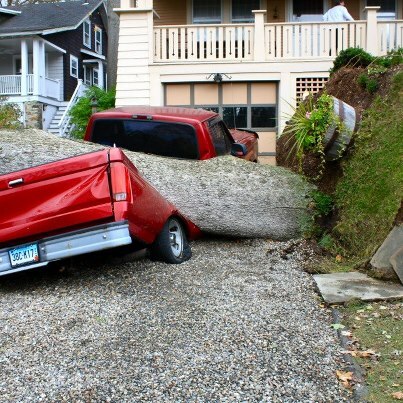 – Photo credit for the poor red truck goes to my daughter. Her first ‘published’ photography!